One million sq. ft. of shimmering aluminum-coated fabric tied with bright blue synthetic rope. Their romance was meant to be. They were born on the same day, June 13, 1935. In their 20s they fell in love. She was born to well-to-do French parents. He was a penniless Bulgarian refugee. Her parents disapproved; they said he would never amount to anything. The couple moved to Paris where they fell in love again…this time with the environment and its beauty. Their life’s work in art began. Christo (who goes by his last name only) and his wife, Jeanne-Claude (who goes by her first name only), believe that no one really owns our land, our waters, and our skies. They want to challenge us to see our world as art, and to see it differently. The two artists try to show us that art doesn’t have to be permanent. Their projects are temporary. They cannot be bought or sold and nobody can sell tickets. Christo and Jeanne-Claude accept no sponsors. All projects are completely financed by the sale of their project drawings, prints and scale models. So how do the artists actually make their art? 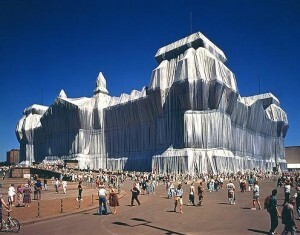 Christo and Jeanne-Claude “gently disturb” the environment. They wrap famous landmark bridges and buildings in Europe with effervescent synthetic fabric. They surround small islands in Florida with floating fabric. They install thousands of huge blue and yellow umbrellas in the countryside of Japan and California. They design bright orange silk fabric gates for New York’s Central Park. Millions of people come to see the things they see everyday. Ah, but now they are different. What was familiar is now changed. They are seen anew! All projects are dismantled and completely taken down after two weeks. 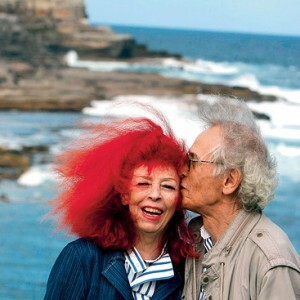 Christo’s wife and artistic muse, Jeanne-Claude, died in 2009, of a brain aneurysm. But Christo believes her fearless creative spirit will always be with him. Next project: “Over The River.” It’s a temporary work of art by Christo (and Jeanne-Claude) to suspend 6 miles of silvery, luminous fabric panels high above the Arkansas River along a 42-mile stretch of Southern Colorado. Captivating Video of Christo and Jeanne-Claude’s Art! Hi, For years I considered Christo’s stuff to be kind of silly. When they did the orange running wrap in Central Park I was living in NY. One snow laden afternoon we decided to go take a look and much to my amazement I loved it. Not so much IT but what IT engendered. A lot of people who probably wouldn’t have been in the park otherwise and lot who made a habit of it were intrigued by Christo’s work. What really won me was that people were talking to one another, strangers laughing and sharing thoughts about this act of art that surrounded them. The sense of community was wonderful and made me understand that this is one of the things that art, of any kind, can do. It was serene and exhilarating at once. I was happy to hear your reaction to their work. I love it when art creates conversation and interacts with community. I just recently found out that Jean – Claude has passed on. I found their partnership inspiring and moving. Interesting that in the early yr. stuff was credited to Christo & not her. They subsequently & retroactively changed that so they were both given credit. Thankfully she live to see the gates finished in NYC – a process of over 20 yrs. Thank you for posting it. Thx Susie for the info about Christo & Jeanne-Claude’s accreditation & the length of time it takes to secure approval from the powers that be for their projects! Very interesting details. They are the only couple in the world who would fight over who gets to wrap the presents at Christmas time. Their loving work is totally mind-boggling, Kirby. The images are so gentle and respectful – splendidly artistic, yet ultimately ephemeral. Kirby Girl, you have really spread your wings. You give us so much inspiring information. Taking time out to enjoy your blog of visual treats and information is giving myself a quality time treat. I saw the Van Gogh exhibit at the Denver Museum and cried. It was so moving, it was though he had just finishing the painting and was standing near by.